Tomorrow’s leaders apply their skills to outdoor conservation. Oil market consultant Garrett Golding of Dallas is standing on the shore of a freshwater marsh off Matagorda Bay, looking into the lens of a video camera. He’s part of a new organization that’s getting young, urban professionals into outdoor conservation, and he has volunteered to be in a video about it. Meet Stewards of the Wild, a program of the Texas Parks and Wildlife Foundation, the official nonprofit partner of the Texas Parks and Wildlife Department. The first Stewards chapter started in Dallas in 2011, followed by more chapters in Austin, Houston and Fort Worth, with San Antonio on the way. In December 2015, the program had about 450 members statewide. Foundation Associate Director Jay Kleberg helped launch the Stewards, starting with like-minded friends, including grad school peers. 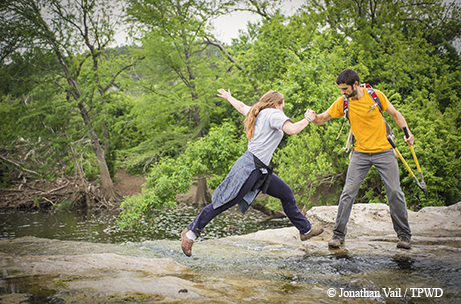 A trail work day at McKinney Falls requires a leap across the creek. There are lots of conservation nonprofits, many with long pedigrees that have been around many decades. One thing different about Stewards of the Wild is it focuses on younger 30-somethings in urban centers. The chapters organize trips to get these folks out of town for outdoor adventures in breathtaking natural settings, often paired with talks by wildlife scientists who lay out conservation issues and solutions. Few people may understand urban sprawl from a more personal perspective than Samantha “Sam” Fechtel, an Austin chapter leader who works for a medical device commercialization company. What used to be her family’s farmhouse is now the town square for the City of Southlake north of Dallas/Fort Worth. 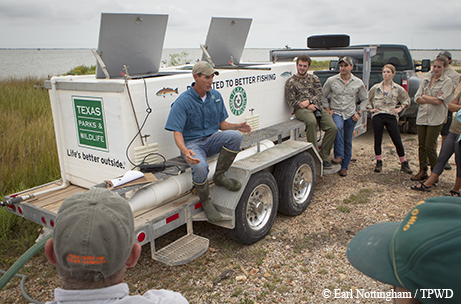 Group members learn about redfish during a fingerling release at Powderhorn Ranch on the coast. “Last time I was there it was so far developed beyond anything I would have imagined, covered in stores and restaurants,” Fechtel says. This was her childhood nature place, where her granddad had a farm that he would lend out for church retreats, where her parents got married, where she played outdoors in summer. Yet Fechtel is surprisingly philosophical, not bitter, about its urbanization. Fechtel never lived in the country but always had ready access to it through family and friends. Now, because of her Stewards experience, she says: “I’m way more aware of and thankful of state resources. I can get to McKinney Falls State Park in 20 minutes in traffic.” She’s also been to a handful of other state parks across the state, all new to her. 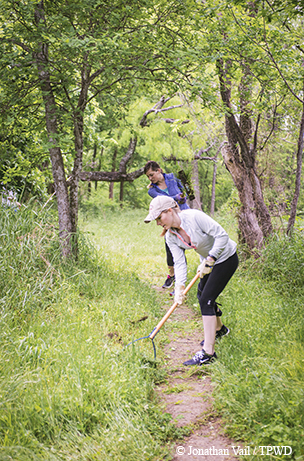 Stewards help maintain a trail at McKinney Falls State Park in Austin. Most Stewards members are outdoor evangelizers, but Ben Masters brings a unique media vision. A native Texan with a Texas A&M wildlife biology degree, he was the “mastermind” behind Unbranded, a documentary film about wild mustang horses. In 2010, he and two friends completed a 2,000-mile ride along the Continental Divide. Broke at the time, they adopted some $125 mustangs from the Bureau of Land Management. Masters brought film director Phillip Baribeau on board, and then persuaded organizations and individuals from around the world to support the film. His next project? He wants to make a film about wildlife and habitat conservation issues in Texas.